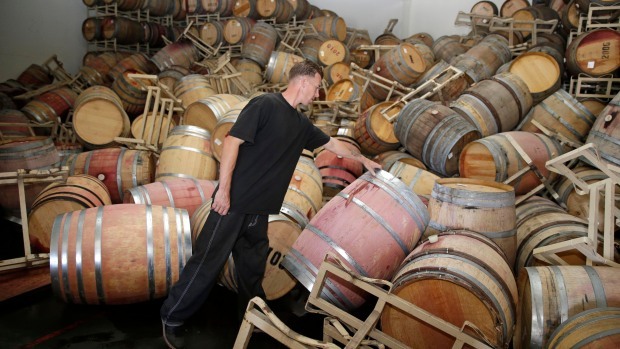 Five small quakes and aftershocks rumbled through wine country early Tuesday, days after the biggest earthquake in 25 years hit the Bay Area. The shaking in the wee hours of the morning startled and concerned residents 75 miles away in Mountain View and in nearby Vallejo. Anna Solberg of Vallejo, five miles from the epicenters, said she felt her house shake "from left to right." But that shaking was much gentler than what she felt in her home on Sunday, when a 6.0-magnitude quake rocked the same area around 3:20 a.m. That was the largest earthquake to impact the Bay Area since the 1989 magnitude-6.9 Loma Prieta earthquake. "My first thought was 'Oh my gosh, another earthquake,''' she told NBC Bay Area by phone, adding that she had been in bed awake just as the quakes hit. "But I just heard felt one thud." Three days since Sunday morning's 6.0-magnitude earthquake, many residents in and around Napa are trying to recover without electricity or water. Kimberly Tere reports. Still, she acknowledged she felt about "half as much" shaking Tuesday as she had felt Sunday. The U.S. Geological Survey clocked a magnitude-3.9 temblor and three aftershocks striking between 5:30 a.m and 6 a.m. just a few miles from American Canyon. The aftershocks were reported at 2.7, 2.8 and 3.0 magnitudes. A fifth magnitude-2.5 aftershock hit four miles south of Napa at 10:56 a.m. An aftershock is a smaller earthquake following a large earthquake in the same region. Despite the number of temblors – four in 90 minutes – there didn't seem any damage reports, according to Barry Martin, community outreach coordinator for Napa. He said crews would be going out again to check for any water line breaks and power outages. 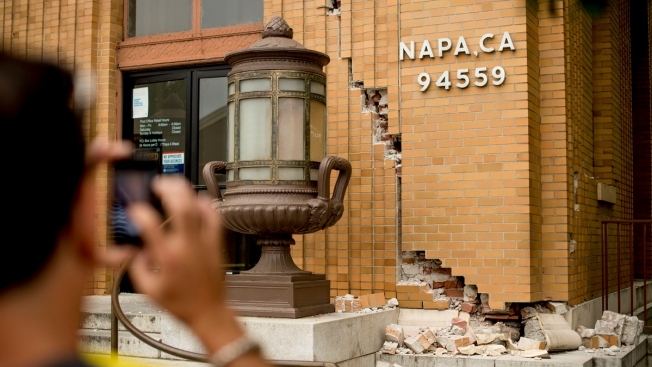 The four aftershocks hit in the same general region where the South Napa earthquake struck Sunday, requiring hundreds of buildings to be red- and yellow-tagged, mostly in the heart of historic downtown Napa. A post office, library and a 141-room hotel were among more than 160 homes and buildings either deemed unsafe to occupy or enter. Aftershocks are quite common, even expected. "Anytime you have an earthquake, the probability of another earthquake goes up," Cecily Wolfe of the USGS Earthquake Hazards Program told NBC News. Earthquakes tend to come in clusters. NBC News reported there is currently a 29 percent chance that a magnitude-5 or higher quake will hit in the next seven days, according to Northern California Seismic System (NCSS) probability report. In fact, experts say that there is a 5 to 10 percent chance of something bigger than a 6.0-magnitude quake coming in the next week, according to the NCSS report. 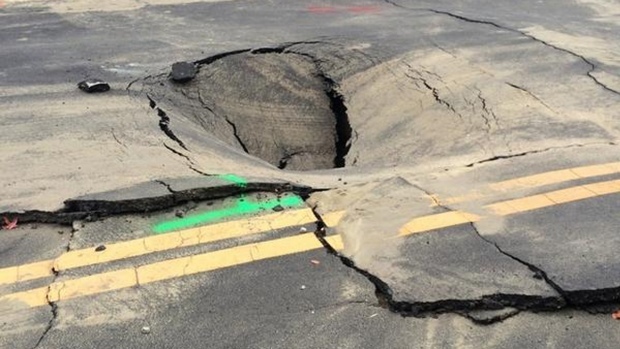 NBC's Joe Fryer was staying in a hotel in Vallejo and awoke when he felt the first earthquake Tuesday. "It was the strongest aftershock since the main earthquake hit," he said. Sunday's South Napa earthquake hit along the West Napa Fault, the most seismically active of the faults, according to the USGS. 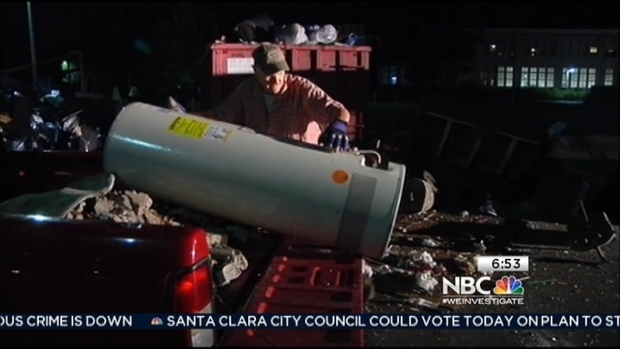 But as for John King, a Napa resident who was busy on Tuesday morning carting his damaged water heater to one of the city dumping spots, earthquakes are the price you pay for living in the Bay Area. "It's a beautiful place to live," King said. "This is what goes with it. You get it together, and you move on."